This page will be permanently updated with information about exhibitions, symposia, seminars, conferences and other events related to Art Nouveau. Please feel free to comment if you are organising an event of if you know of an event that is missing from this list! 17 October 2019 – 26 January 2020, Exhibition Pre-Raphaelite Sisters: Models, Artists, Muses, National Portrait Gallery, London, UK. This major exhibition is the first-ever to focus on the untold story of the women of Pre-Raphaelite art. 160 years after the first pictures were exhibited by the Pre-Raphaelite Brotherhood in 1849, Pre-Raphaelite Sisters, explores the overlooked contribution of twelve women to the Pre-Raphaelite movement, including Evelyn de Morgan, Effie Millais (nee Gray), Elizabeth Siddal and Joanna Wells (nee Boyce), an artist whose work has been largely omitted from the history of the movement. Featuring new discoveries and unseen works from public and private collections across the world, the exhibition reveals the women behind the pictures. October 2019, The 8th Mackintosh Festival, Glasgow, UK. From walks, workshops and exhibitions to performances and talks, events are designed for all ages, to appeal to those who know nothing about Mackintosh, as well as established aficionados. The programme features a range of formats with free exhibitions and workshops, ticketed tours and sociable evenings with food and drink. 13 – 15 September 2019, Jugendstil Festival, Bad Nauheim, Germany. Once a year, the golden age of the former world-renowned spa resort world bath comes alive again when Bad Nauheim celebrates its art nouveau festival! Art nouveau and nostalgia fans find plenty to suit their interests with clothes, dancing and games from yesteryear, demonstrations of historical crafts, or lectures and exhibitions on how the Jugendstil reform movement influenced society and culture. For three days, festival goers feel like they’ve been transported back to the turn of the 20th century. At the artisan and restorers market, art lovers can admire the wide repertoire of art nouveau craftsmanship with exhibits and demonstrations of typical stucco, ceramic, glass, wood and jewellery works. July 2019 – ? ?, Exhibition Oriental Light, Lalique Museum, Doesburg, The Netherlands. Exhibition about the Japanese influence on Western art with, among others, jewelery by Antoine Bricteux and Maison Vever. 29 June – ??? 2019, Exhibition Jugendstil – Donation F. W. Neess, Museum Wiesbaden, Wiesbaden, Germany. The Ferdinand Wolfgang Neess collection is one of the most significant European private collections of Art Nouveau and Symbolism. Not only was the museum able to keep the collection in Germany, it, at once, put itself on equal footing with Europe’s leading museums for Art Nouveau and promises to become one of the most important centers for Art Nouveau in Germany. Comprising some 570 objects, the collection is distinguished both by the exceptional quality of the works and by their remarkable art-historical significance. A distinctive feature of the collection lies, as well, in its international character, including German, French and Austrian works of art and having been conceived entirely in the spirit of unity that defines Art Nouveau. Furniture, glass, ceramics, lamps, paintings and silver all come together here to create the total work of art. This Gesamtkunstwerk represents the spirit of that historical moment to unify art and nature inseparably. 22 June 2019, Rausch der Schönheit – Spaziergang im Kaiserstrassenviertel, Museum für Kunst und Kulturgeschichte, Dortmund, Germany. Wolfgang Kinast zeigt das Kaiserstraßenviertel. Vom Ostfriedhof beginnend durch das an Jugendstilfassaden und Geschichten reichen Viertels. Treffpunkt: Eingang Ostfriedhof. In 2013, the 10th of June was selected as World Art Nouveau Day, being the day on wich both Antonio Gaudi and Ödön Lechner died – two charismatic architects of the movement, from two different corners of Europe. Since then, every year, we celebrate Art Nouveau on the 10th of June. Organisations from all over the world participate with exhibitions, photo competitions, lectures, Art Nouveau walks etc… Follow this Facebook Event Page so you can keep up with all the activities planned..
1 June – 1 Sept 2019, Exposition Bommelse Art Nouveau: de werkplaats Onder den Sint Maarten, Stadskasteel Zaltbommel, Zaltbommel, The Netherlands. Aan het einde van de negentiende eeuw en het begin van de twintigste eeuw was Zaltbommel een belangrijk, maar onderbelicht productiecentrum van de Nederlandse Art Nouveau. Het modern vormgegeven meubilair en koperwerk uit de Zaltbommelse werkplaats Onder den Sint Maarten maakte indruk op internationale tentoonstellingen voor decoratieve kunst in Turijn en Parijs. De Bommelaar Johan Adam Pool jr. (1872-1948) stond aan de basis van de werkplaats. De tentoonstelling vindt plaats tijdens het Cultuurfestival Bommelerwaard 2019 en is geopend in de weekenden tussen 1 juni en 1 september. Het bezoek aan de tentoonstelling verloopt in de vorm van een ‘Onder den Sint Maarten arrangement’. Een gids ontvangt u in het museum, loopt met u door de Zaltbommelse binnenstad langs enkele Art Nouveau panden en geeft een inleiding in de tentoonstelling. 31 May, 1 and 2 June 2019, Modernista Fair, Barcelona, Spain. Barcelona travels back in time to the turn of the 20th century for yet another year, with plenty of leisure and cultural activities on offer, such as guided tours, children’s workshops, Modernista puppets, interactive automatons, a parade of vintage cars, a vintage steam train ride, conferences on Modernisme, a ticket draw to visit Modernista buildings for those attending in period costume, period atmosphere and many more surprises. The Fair will also be attended by municipalities and institutions from around the world that somehow have an Art Nouveau connection, as well as a booth with information and products on sale related to the Barcelona Modernisme Route. 11 May – 21 July 2019, Exhibition Femmes 1900 – The Art Nouveau Woman, Galleria Harry Bertoia, Pordenone, Italy. The considerable number of works on exhibit will allow the viewer a suggestive walk among the European stylistic differences, explaining how authors dealt with the various sensitivities around the theme of femininity. From the Spanish Modernism to the French Art Nouveau to the Italian Liberty to the Austrian Secession to the German Jugendstil. Several local events will be organised around the exhibition space. 10 May – 11 August 2019, Exhibition Jewellery from Jugendstil to Art Deco, Hessian State Museum, Darmstadt, Germany. All exhibits are from the private collection Ratz-Coradazzi, not previously exhibited. At the age of seven, the collector already invested her pocket money in her first Art Nouveau jewelery piece. This enthusiasm continues to this day, only that the objects have quality now, and the collection has achieved international rank over the years. Having long been assisted by her husband, she successfully works through archives and libraries to identify the jewelry and assign them to a manufacturer. Thus, the exhibition is a “Who’s Who” of German and Austrian jewelry design. 10, 11 & 12 May 2019, Modernista Fair, Terrassa, Spain. An amazing journey to the past to the splendor of modernist Terrassa in the late nineteenth and early twentieth centuries. Unique characters, historical recreations, traditional craftsmen, visits to the main modernist buildings, exhibitions, shows and especially the warmth of the people who star in the Fair on the street with their period costume, offer us the opportunity to experience a unique experience. 30 March – 21 July 2019, Exhibition Mucha, Pearl Art Museum, Shanghai, China. Information will follow as soon as available. 22 March – 23 June 2019, Exhibition ‘De Bijzondere Band. Art Nouveau-boeken van Dijsselhof, Lion Cachet en Nieuwenhuis, Museum Meermanno, The Hague, The Netherlands. The exhibition focuses on the work of three pioneers. For this exhibition, top pieces from the collections of Museum Meermanno and the Royal Library have been supplemented with beautiful books and applied graphics from collections of the Leiden University Libraries and Royal Collections. From about 1890 to 1910, Gerrit Willem Dijsselhof, Carel Adolph Lion Cachet and Theo Nieuwenhuis – together with a number of colleagues who are also featured in the exhibition – have ensured the heyday of the book as an aesthetic object. 16 March – 2 May 2019, Hungarian Art Nouveau: Artist’s Colony of Gödöllő, Balassi Institute, Brussels, Belgium. In 1901 Aladár Körösfői-Kriesch together with his friend and brother-in-law, Sándor Nagy, founded their colony in Gödöllő. Their intention was to make life more beautiful by their creations. Besides their major works of art, they also designed unique, artistically-designed objects of applied arts. The joint exhibition of the Balassi Institute in Brussels and the City Museum of Gödöllő wishes to draw attention to a special section of the Hungarian Art Nouveau, when presenting the Artists’ Colony of Gödöllő. 16 March – 31 March 2019, BANAD Art Nouveau & Art Deco Festival, Brussels, Belgium. The long-established Brussels Biennial Art Nouveau & Art Deco Event, held in October every two years, was changed. From 2017, it has become an annual event called the Brussels Art Nouveau & Art Deco Festival and it will be held in the Spring.The Festival’s programme will be extended to include concerts, films, exhibitions and cultural events, in addition to the interior guided tours of buildings not usually open to the public (private houses, schools, industrial and office buildings) and the guided tours on foot, by bicycle and by coach that have made the Biennial Event so successful in the past. 16 March 2019, Rausch der Schönheit – Spaziergang im Kaiserstrassenviertel, Museum für Kunst und Kulturgeschichte, Dortmund, Germany. 15 March – 22 September 2019, Exhibition Quirky Art Nouveau. Carl Strathmann, Münchner Stadtmuseum, Munich, Germany. The highly original and fabulously bizarre art of Carl Strathmann (1866-1939) resists any kind of pigeonholing. This Art Nouveau painter, who boasted an ornate style and a fastidious obsession with detail, lovingly fashioned his own unique worlds from fairy-tale caricature figures, fantastical floral still lifes and landscapes, symbolist history paintings and art-and-craft designs. This exhibition offers you an unmissable opportunity to discover one of the Munich art scene’s most colorful personalities from the turn of the 20th century and discover, for the very first time, his extraordinary art. 15 March – 26 August 2019, Exhibition Charles Rennie Mackintosh, Walker Gallery, Liverpool, UK. Rediscover the life and work of architectural genius, designer and artist Charles Rennie Mackintosh (1868–1928) alongside the work of his closest friends and contemporaries in this must-see exhibition. Featuring more than 250 objects, ranging from furniture and embroidery to stained glass, metalwork and architectural drawings, the exhibition explores the movement that became known as The Glasgow Style – the only Art Nouveau movement in the UK. 13 March – ??? 2019, Exhibition Kayserzinn – German tin in the 19th – 20th centuries, Modern Museum, Samara, Russia. Kaiser Tin (an alloy of tin and silver, the so-called lead-free tin, which retains its brilliance for a long time) was very successful at exhibitions in Paris (1900), Turin (1902), Dusseldorf and St. Louis (1904). Kaiser and Sons created designs inspired by both the floral French art nouveau and the linear art nouveau. In addition, the company set itself the goal of mass production to make modern, tastefully decorated household items accessible to wide sections of the population. The exhibition includes an original series of items from the collection of private collector Sergei Gnilitsky. 13 March – 30 June 2019, Exposition The Nabis and the Scenery, Musée du Luxembourg, Paris, France. True pioneers of modern decor, Bonnard, Vuillard, Maurice Denis, Sérusier, Ranson, have defended an art directly related to life, allowing to introduce the beauty in everyday life. From the formation of the group, at the end of the 1880s, the decorative issue became a fundamental principle of the unity of creation. They advocate an original expression, joyous and rhythmic, in reaction against the aesthetics that were fashionable at the time. This exhibition is the first in France devoted to the decorative and ornamental art of the Nabis. Yet it is an essential area for these artists who wanted to break the line between fine and applied arts. 9 March – 30 June 2019, Exhibition Mucha’s Thoughts leading to the Slav Epic, Alphonse Mucha Museum, Sakai city, Japan. Alphonse Mucha (1860-1939), who became famous as a designer at the end of the 19th century, was asked to do a lot of work for the 1900 Paris World Exposition. Among his jobs a mural at the Bosnia & Herzegovina pavilion. This strengthened Mucha desire to be useful for the people of ‘his’ Czech homeland. “After I have gathered funds across the U.S. to realize my contribution to my country, I will return to the Czech Republic in 1910.” Then, he made numerous works for his country, starting with the “Slavic Epic”. This exhibition will introduce mainly works of the latter half of his painting carier which traces the changes in his work after the World Expo, realizing his feelings towards the Czech Republic. Although the posters of elegant females from his Paris era are famous, in this exhibition, please enjoy not only the graphic work, but also works which transmit Mucha’s breath, especially large oil paintings, sculpture, etc. All 20 works of the “Slavic Epic” will be displayed by a large size projector. 8 March – 23 June 2019, Exhibition Mesdag & Colenbrander- a shared passion for ceramics, De Mesdagcollectie, The Hague, The Netherlands. Theo Colenbrander (1841-1930) is seen as one of the first industrial designers. The couple Hendrik Willem and Sientje Mesdag were the first to buy his modernly designed earthenware, for their home and their museum. The collection of Colenbrander ceramics from the Mesdags is one of the most beautiful collections in the Netherlands. When Hendrik Willem Mesdag died in 1915, the collection included about 130 objects and sets. Unfortunately, after his death, pieces from the private collection got scattered. But for this exhibition a part of those objects have returned to their original home. 8 – 10 March 2019, Study Weekend The Whiplash Line – Art Nouveau and Symbolism, Gladstone’s Library, Church Lane, Hawarden, Flintshire, UK. This study course looks at the richness of Art Nouveau in the Fine and Decorative Arts – including painting, posters, illustration, sculpture, architecture, textiles, metalwork, glass, furniture, ceramics and much more. Illustrated with beautiful and seductive colour slides throughout. 1 March – 12 May 2019, Exhibition Paris 1900: City of Entertainment, Cincinnati Art Museum, Cincinnati, OH, USA. Organized by the Petit Palais Museum of Fine Arts with additional loans from other institutions in the City of Paris, this exhibition presents more than 200 works of art made at the turn of the century in the vibrant and rapidly changing city. Arranged in thematic sections including the International Exposition, Art Nouveau, the Parisian Woman and Paris by Night. Each section is developed through a range of objects, from paintings, sculptures and posters to fashion, furniture and souvenirs. Notable artists featured include Pierre-Auguste Renoir, Camille Pissarro, Henri de Toulouse-Lautrec, Auguste Rodin, Antoine Bourdelle and Camille Claudel. 15 – 17 February 2019, Annual Arts & Crafts Conference, , Grove Park Inn, Asheville, NC, USA. Since 1913 the Grove Park Inn has been known as the mecca for Arts and Crafts enthusiasts. And since 1988 the Arts and Crafts Conference has been educating and entertaining Arts and Crafts enthusiasts at every level – from beginning collectors and bungalow owners to experienced auction and show veterans. The weekend includes seminars and small group discussions to walking tours, demonstrations, and selling shows. 14 February – 5 May 2019, Exhibition Van Gogh to Munch: Seduction and Anxiety, McNay Art Museum, San Antonio, Texas, USA. The end of the 19th century gave rise in Europe to heightened anxiety about the future. This anxiety, coupled with greater exploration of sexuality and the human psyche, led to the creation of psychologically charged and complex art. Some artists, such as the Symbolist Charles-Marie Dulac, turned to Catholicism in their work to suggest a way forward; others, such as Paul Gauguin, sought deeper human truths in faraway cultures seemingly unspoiled by the progress of industrialization. This exhibition traces the development of art focused on the inner world of the human mind, from Vincent van Gogh’s penetrating portrait of his last medical doctor, Paul-Ferdinand Gachet, to a claustrophobic brothel interior by Edvard Munch. 19 January – 16 June 2019, Exhibition Art Nouveau Amphora, Figge Art Museum, Davenport, Iowa, USA. Art Nouveau or the “New Art” emerged in the late 19th century and is recognized for the use of curvilinear forms inspired by nature and a focus on aesthetic beauty. 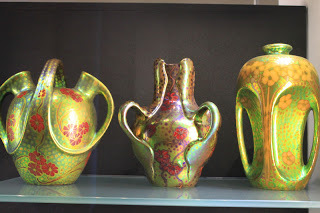 During this period, Louis Comfort Tiffany and his studios created stained glass windows and iridescent art glass, while inTurn-Teplitz, Austria (now the Czech Republic), the manufacturer Riessner, Stellmacher and Kessel (RSt&K), later called Amphora, produced distinctive art pottery. Amphora’s elaborate creations ranged from the elegant to the bizarre and often were finished with striking glazes and gold accents. Some artisans sculpted beautiful women and mythical beasts, while others decorated vessels with images of beautiful women. 19 December 2018 – 22 April 2019, Exhibition Koloman Moser – Universal Artist between Gustav Klimt and Josef Hoffmann, MAK, Vienna, Austria. 18 December 2018 – 1 December 2019, Exhibition Chris Lebeau – Flora & Fauna, TextielMuseum, Tilburg, The Netherlands. From peacocks to ibis, from dandelion to maple tree: at the exhibition ‘Chris Lebeau I Flora and Fauna’ you experience the plant and animal world as decorative artist Chris Lebeau (1878-1945) created it. With nature as his source of inspiration, he designed beautiful and innovative patterns for textiles in the art nouveau style. He knew how to catch a large variety of natural motives in stunningly styled designs for damask, batik, and velours. Even today, they are true eye-catchers. The versatility of Lebeau as a ‘textile artist’ is the focal point of the exhibition. Historic sample books are presented in order to illustrate how the designer learned how to stylise natural motives and translate them into ornament prints. 9 December 2018 – 1 april 2019, Exhibition Freemason Alfons Mucha, Dačický House, Kutna Hora, Czech Republic. The Czech Art Nouveau painter Alfons Mucha became famous thanks to his series of large canvass paintings rendering important events in the history of the Czechs and Slaves, The Slav Epic. It is not however generally known that Alfons Mucha was a co-founder of the first Czech speaking lodge of freemasons, “Jan Amos Komenský“. He was regarded as the highest representative of the Czechoslovak freemasons of the First Republic. It is the 100th anniversary of the foundation of the first Czech Lodge of Freemasons that was an incentive for the realization of this exhibition. Masons regarded the lodges as a means of building a free and democratic republic. The exhibition will reveal the secrets of freemasons and, at the same time, show the unknown aspects of Alfons Mucha’s life. 8 December 2018 – 23 June 2019, Exhibition Rausch der Schönheit. Die Kunst des Jugendstils (Intoxication of beauty. The Art of Art Nouveau), Museum für Kunst und Kulturgeschichte MKK, Dordtmund, Germany. Based on its own collection, the exhibition intends to present the Art Nouveau in its diversity, but also to show the upheavals of the time and pose the question of today’s significance. 7 December 2018 – 3 March 2019, Exhibition Kachō-ga. The Poetry of Japanese Nature, Japanmuseum Siebolt Huis, Leiden, The Netherlands. Never before has an exhibition on Kachō-ga -one of the most important genres in the Japanese art world- been held in the Netherlands. This ‘must see’ exhibition for Japanese art lovers includes imposing works such as woodblock prints, decorative screens, scrolls and photographs on loan from private and public collections. 23 November 2018 – 3 March 2019, Sarah Bernhardt’s World Exhibition, Mucha Museum, Osaka, Japan. 14 November 2018 – 3 March 019, Exhibition Simply Danish, Silver Jewellery of the 20th Century, Bröhan-Museum, Berlin, Germany. The exhibition “Simply Danish” presents the collection of the Berlin couple Marion and Jörg Schwandt with around 170 works of silver jewelry by 48 Danish artists, including icons like Georg Jensen and Mogens Ballin. The collection provides an overview of the various currents of Danish jewellery design in the twentieth century. The spectrum reaches from floral belt buckles in an art nouveau style, constructivistic works from the 1930s, to typically organic shapes from the 1950s. 27 October 2018 – 17 March 2019, Exhibition Polish Fin de Siècle Art – Młoda Polska, Gothenburg Museum of Art, Gothenburg, Sweden. In a broader perspective, the exhibition reflects the changes in Europe. The artists were born in countries like Congress Poland, Prussia, Schleswig, and the Austro-Hungarian Empire, and died in Poland, France, Germany, and the Soviet Union. Movements across national borders and the redrawing of the map of Europe are themes that characterize both the turn of the century 1900, as well as the present age. 20 October 2018 – 19 May 2019, Exhibition Spellbound by Japan. Louis Couperus and the Cord of Redemption. Couperus Museum, The Hague, The Netherlands. Couperus’s two last books: Nippon (1924) and Het snoer de ontferming en Japansche legenden, 1925 (The Cord of Redemption and Japanese Legends) were the result of a trip, commissioned by a Dutch weekly, Haagsche Post, in 1921-1922, through the Dutch East Indies and Japan. The first book consists of a series of travelling letters, the latter is a literary elaboration of Couperus’s trip. Nippon has been translated into English (in 1926). A Japanese translation, by Yumiko Unimoro, is in the making. The current exhibition in the Louis Couperus Museum is inspired by the new edition of Het snoer der ontferming by dr H.T.M. van Vliet (see picture). It focusses on all the sources Couperus used: Japanese prints by famous artists such as Utamaro, Hirosighe, Motonobu and Hokusai as well as Japanese traveling guides, art books and reports by famous visitors to Japan such as Basil Chamberlain and Lafcadio Hearn. 20 Oct 2018 – 26 May 2019, Exhibition Biscuits van Theo Colenbrander, Museum Gouda, Gouda, The Netherlands. De veelzijdige vormgever Theo Colenbrander (1841-1930) wordt gezien als de grondlegger van de art nouveau in Nederland. Aan het einde van zijn lange carrière werkte hij kortstondig voor Plateelbakkerij Zuid-Holland in Gouda (1912-1913) en trad hij vervolgens in dienst van Plateelbakkerij Ram in Arnhem (1913-1928). In deze periode maakte Colenbrander een groot aantal modellen in biscuit waarop hij met potlood en waterverf uiteenlopende decors aanbracht. Deze modellen dienden als voorbeeld voor de plateelschilders. Hij gaf ze stuk voor stuk een naam, variërend van ‘aardbei’, ‘kantwerk’ of ‘krachtig’ tot aan ‘draaiing’, ‘bruisend’ of ’warrig’. Een aantal van deze bijzondere modellen is nu te zien in Museum Gouda. De geëxposeerde biscuits zijn door Colenbrander zelf van een decor voorzien, inclusief de nodige aanwijzingen waar het de kleuren betreft. Ze bieden een bijzonder inkijkje in de wereld van de ontwerper en de vervaardiging van plateel in Gouda en Arnhem. 18 October 2018 – 17 February 2019, Exhibition Egon Schiele – Pathways to a Collection, Orangery, Lower Belvedere, Vienna, Austria. 2018 is the centenary of Egon Schiele’s death. Marking this occasion, the Belvedere is showing its collection of Schiele paintings with highlights including Eduard Kosmack, Façade of a House, Death and Maiden, Embrace, and Four Trees. Visitors can look forward to an outstanding presentation shedding light on the full extent of the Schiele collection once housed at the Belvedere. The exhibition places a focus on the collection’s history. Curator Kerstin Jesse will answer questions about the works’ acquisition, their subject matter, and the people they portray. Preliminary studies and sketches will also be included. The Belvedere conservation department has been researching Egon Schiele’s works and his painting techniques since 2016 and their findings will be presented in the show. The exhibition presents an opportunity to gain an insight into the artist’s working methods while also offering a fascinating glimpse of his works’ pathways into the museum’s collection. 16 October 2018 – 27 September 2020, Exhibition Earth into Art—The Flowering of American Art Pottery, Morse Museum of American Art, Winter Park, Florida, USA. 20 September 2018 – 10 June 2019, Exhibition What to do with the facade of the Hotel Aubecq, one of Victor Horta’s finest achievements, Kanal – Centre Pompidou, Brussel, Belgium. Hôtel Aubecq is one of Victor Horta’s finest achievements. It was sold in 1948 with all its furniture, which had also been designed by Horta, to private buyers interested in property development. The furniture would later be resold, ending up scattered in public and private collections. Informed of the building’s forthcoming demolition, the Minister of Public Works released funds so that part of the façade could be dismantled and stored. This was the beginning of a long odyssey for 650 stones, shipped around on six occasions from wastelands to warehouses. In 2001 the Brussels-Capital Region was landed with these forgotten fragments, the vestiges of a prestigious heritage. What now? Such is the question that this exhibition seeks to raise. It will also be the main theme of a series of lectures taking place in the following months at KANAL – Centre Pompidou. 15 September 2018 – 3 February 2019, Exhibition William Morris – More Than Floral Wallpaper, Millesgården Museum, (Lidingö) Stockholm, Sweden. The first exhibition in Sweden of the versatile English designer William Morris, whose ideas on craft and quality spread throughout Europe at the turn of the 20th century. Through artworks, wallpaper, fabrics and furniture the exhibition presents his life and work. It is the story of a successful businessman and manufacturer who was also a fervent socialist. Produced by Millesgården, the exhibition is a collaboration with the William Morris Gallery, the William Morris Society and Style Library in London. 8 June 2018 – 15 Sept 2019, Exhibition An Architect’s Dream. Falconnier Glass Brick, Château de Nyon, Nyon, France. For the first time, the work of the Gustave Falconnier (1845-1913), who was both architect and inventor of the first blown glass brick in 1886, is studied and presented in an exceptional exhibition. His invention, noted in the world of architecture, was awarded at the Universal Exhibition of Chicago in 1893 and Paris in 1900. The famous glass brick allows the realization of the glass wall, an innovation at the time. This material with multiple applications was quickly adopted for its practical and aesthetic qualities by renowned architects, such as Hector Guimard – author of the famous metro entrances in Paris – or, later, Le Corbusier. 15 April 2018 – 30 January 2019, Exhibition Horta Motifs. Fabric and wallpaper in Brussels houses, Autrique House, Brussels, Belgium. Art Nouveau was a very significant period for the creation of wallpaper and fabrics. Inside Art Nouveau buildings, both Victor Horta and his contemporaries gave meaning to the concept of total art and revolutionised the applied arts, abolishing the hierarchy between different forms of plastic art. Original motifs, complex craftwork… the exhibition restores this fragile heritage to the place it deserves in the history of forms. 28 November 2017 – 20 January 2019, Exhibition Stanisław Wyspiański (1869-1907), The National Museum, Kraków, Poland. The National Museum in Kraków has gathered the largest and most valuable collection of works by Stanisław Wyspiański (1869-1907) – one of the most important, original and appreciated artist from the turn of the 19th and 20th centuries, who belongs among such artists as Klimt, Mucha and Gaudi; the exhibition comprises of about 900 works. In the year of the artist’s death, a committee was established with the aim to collect pieces representing the genius artist’s legacy at the National Museum. The majority of the pieces collected are drawings, scenographic and typographic designs, but the works also include an exquisite collection of portrays and landscapes, mostly pastels, at which Wyspiański was an absolute master, as well as a set of ornamental designs for the Franciscan Church in Kraków, the Wawel Cathedral and the Medical Association House. Apart from the above mentioned works, the exhibition will feature pieces of furniture, fabrics and other everyday objects created by Wyspiański, as well as his sculptures, graphic designs, art books and even some of the artist’s personal belongings. 28 November 2016 – 31 December 2019, Exhibition St. Petersburg Art Nouveau, Museum of History of St. Petersburg, Peter & Paul Fortress, St. Petersburg, Russia. The exhibition presents architectural graphics from projects of public buildings, apartment buildings and houses, bridges, interior decoration and furniture made by famous architects and designers like Vasilyev, von Gauguin, Johansen, Lancer, Lyalevich and Ol. An addition to this section are the decorative and architectural details of buildings in St. Petersburg: glass, iron castings, and architectural ceramics. There are also sections with furniture and lighting fixtures, graphic art Nouveau and gorgeous silk dresses, shoes, bags and boas of ostrich feathers. the first exhibition in the United States not only to showcase the seminal work of Charles Rennie Mackintosh (1868–1928) but to locate his production in relation to the larger circle of designers and craftspeople with which he shared sources, stylistic features, and patrons. The exhibition’s approximately 170 works, drawn from Glasgow’s most important public and private collections, will include iconic designs for, and work from, the city’s famous tearooms, including Mackintosh’s first high-backed chair, light-fittings and paneling sections; studies and finished works in a variety of media by talented GSA students, teachers, friends and associates such as Jessie Marion King, Ann Macbeth, and Talwin Morris; and several rarely exhibited watercolors. Alongside seminal posters, drawings, book illustrations and designs, the exhibition will include artefacts from Mucha’s art collection, including Japanese prints and Chinese textiles, and interpretations of his work in fin-de-siècle Japan. It will show how his legacy influenced psychedelic rock culture in the US and the UK and Japanese Manga from the 70s to the present day. The exhibition will incorporate digital displays of manga/anime images, along with music associated with the rock posters and record jackets shown in the exhibition. This exhibition celebrates the artistry and craftsmanship of the Tiffany artworks from Chicago’s distinguished Richard H. Driehaus Collection, highlighting masterworks never before presented in a comprehensive exhibition. A celebration of beauty, this exhibition features more than 60 extraordinary objects, spanning over 30 years of Tiffany’s prolific career. The Pre-Raphaelite Brotherhood, William Morris and his associates, and the champions of the Arts & Crafts Movement offered a radical artistic and social vision that found inspiration in the pre-industrial past and came to decisively influence visual culture in Britain and beyond. Drawn from the outstanding collection of the city of Birmingham, United Kingdom, Victorian Radicals will, for the first time, bring together paintings, works on paper, and decorative arts—many never shown outside the UK—to illuminate this most dynamic period of British art in an exhibition of unparalleled historical and visual richness. Through approximately 145 objects by pioneering artists including Ford Madox Brown, Edward Burne-Jones, William Holman Hunt, John Everett Millais, William Morris, Dante Gabriel Rossetti, and Elizabeth Siddall, among others, Victorian Radicals will represent the spectrum of avant-garde practices of the Victorian period, emphasizing the response of Britain’s first modern art movements to unfettered industrialization. Traveling Exhibition Alphonse Mucha: Master of Art Nouveau. The exhibition is drawn from the holdings of the Dhawan Collection, Los Angeles, which is one of the largest and finest collections of Alphonse Mucha’s work in the United States. Traveling Exhibition Natures of Art Nouveau. The Natures of Art Nouveau exhibition highlights the role of nature in art and architecture across Europe at the turn of the 19th and 20th centuries. The wiry curved lines that are typical of Art Nouveau illustrated the sensuality and vitality of nature. Plants, animals and the elements of nature intertwined in imaginative, dream-like pieces. 10 Different Guided Tours for groups at ARAU: Brussels is Art Nouveau! The Charles Hosmer Morse Museum of American Art, Winter Park, Florida, USA. The work of Louis Comfort Tiffany (1848–1933) is undoubtedly the centerpiece of the Morse Museum collection. The Museum’s Tiffany collection is broad, deep, and unique. It includes fine examples in every medium Tiffany explored, in every series of work he produced, and from every period of his life. The museum is also a treasure house of American decorative art from the mid-19th century to the early 20th century, with especially rich holdings in the area known as Arts and Crafts. Golden Age of the Zsolnay – Collection of László Gyugyi, Zsolnay Cultural Quarter, Pécs, Hungary. The private Zsolnay collection of Dr. László Gyugyi comprising around 600 pieces represents an unparalleled value. Its pieces date back to a 40-year period (1870-1910) that can be divided in three great parts: the periods of historicism, millennium and secession. The collection found a home in Pécs in the framework of the Pécs2010 European Capital of Culture Programme, in the Zsolnay Cultural Quarter, in a secession building that was reorganised for this particular aim in the former Sikorsky villa. The Cauchie House, Brussels, Belgium. The restoration work carried out over nearly fifteen years breathed new life into the building. The first week-end of every month it is open to visitors who appreciate its message of beauty. The successive ground floor rooms each have their own particularities and their content of symbolism. Decorative designs and furniture of the time demonstrate the manifest influence of Charles Rennie Mackintosh (Glasgow School of Art). The upper storeys of the house, where there is no evidence of Paul or Lina’s talents, have been used as apartments and renovated to suit modern contemporary use. The basement, cellar, and artist workshop have been redesigned into a vast gallery to exhibit Paul and Lina Cauchie’s paintings collected by the current owners over time. For a list of all Art Nouveau museums worldwide….. click here!